Snowdon Chalet offers unpretentious lodging in the ‘Golden Triangle’ of Southern Vermont’s ski areas and has been welcoming guests since 1962. This Alpine Chalet style motel offers simple accommodations in 12 guest rooms, each with private baths and large windows overlooking Vermont woodlands. Conveniently located off Route 11 in Londonderry Vermont. Close to Route 100, we are next to Magic Mountain 0.8 mi, Bromley Mountain 7.6 mi, Stratton Mountain 9.1 mi, and Okemo 18 mi. Londonderry is small ski town (and is actually the birthplace of the Burton Snowboard) that offers restaurants, shopping, groceries, bank, hardware, pharmacy etc. 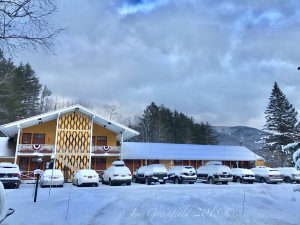 Also nearby are Viking Nordic Center, Wild Wings Touring Center in Peru, VT, Grafton Trails & Outdoor Center, and The Vermont Country Store.